A little know-how goes a long way when it comes to planning a trip to the Maldives. You have probably spent hours eyeballing sun-kissed beaches and ultra-luxurious mega resorts, but how much do you know about Maldives culture? Or are you up to speed on the current currency and money situation in the Maldives? If don’t don’t worry – we’ve done all the hard for for you to bring you the 10 things you need to know before you take your dream vacation to the Maldives. So, Where Exactly Are the Maldives? 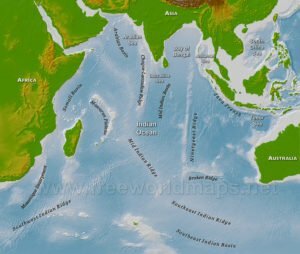 Before we get into the nitty-gritty we will look at the location of the Maldives, as it’s nice to have some geographical info before you go. The Maldives are a collection of over 1,200 islands and sandbanks in the Indian Ocean, that sit below India and Sri Lanka. These islands actually span 800 km from North to South, but they have a tiny landmass, which makes the Maldives the ninth smallest country in the world. However, they also have a population of 440,000, with a majority of people living in Male, which makes it one of the most densely populated cities in the world. Out of all these islands, only 400 or so are inhabited, and there are approximately are 180 Maldives resort islands (although this number is still increasing). We actually have an article which explains the location of the Maldives in more detail. Click here to read ‘Where is the Maldives: Discovering Paradise on Earth‘. The currency and cash situation in the Maldives can be a little confusing. After all, many of the top Maldives resorts are cashless, US dollars are sometimes accepted too. Well this is true, but the main currency of the Maldives is called the rufiyaa (RF), and it is divided into larees. The notes are available in different sizes of 500, 100, 50, 20, 10, 5 and 2. If you are off to chill in a Maldives resort, then you will not need to bring much or even any Maldivian currency along with you. This is because all the big resorts will be able to accept all major debit and credit cards including MasterCard, Visa and American Express. Depending on the package that you choose (all-inclusive or room only etc), your purchases will be added and presented to you as a bill on departure. It’s always worth double-checking the payment types that they accept, as well as exactly what’s his included with your package so that you’re not left with any surprises when you leave. Saying that, you may want to take some cash with you in order to tip your favorite staff. Now tipping isn’t essential on the Maldives, and Maldives resorts have different rules when it comes to tipping. Many will add a surcharge directly onto the bill, but some or not, and it’s always nice to show your appreciation by leaving cash tips for cleaners or that barman who really made your holiday extra special. It is generally accepted okay to tip in US dollars as well. You’ll find currency exchange booths located in the main International Airport as well as around the major tourist areas on Hulhule Island. There are also ATMs in the airport and around the island, and they may be a better option if you want to withdraw cash. 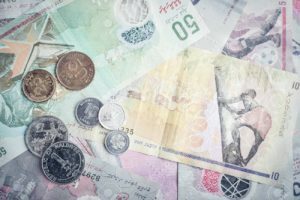 If you want to know more about money in the Maldives then check out this detailed article. It is actually illegal to bring any form of alcohol into the Maldives. When you land, your baggage will go through a scanning system to make sure that you are not carrying any contraband. It’s also illegal to bring any tobacco products which doesn’t have a health warning on them, as well as pork products. The Maldives are an entirely Muslim country, so you must take care to respect the traditions if you plan on visiting the local Islands. This includes making sure that you are dressed modestly – so always cover up your skin. This rule should also be followed on many of the local beaches too. Some of the major hotels with beachfront access allow swimwear – but if in doubt always double check first. This does not count on any of the Maldives resort islands and you are free to wear what you please. Public affection is also a no-no here, as is drinking alcohol of any kind, so make sure that you are respectful if you plan on visiting these local islands. Many people are shocked to find out that the cost of the seaplane can actually match that of the price of an international flight. But that please don’t let that put you off, a seaplane ride will probably be one of the most magical flights of your entire life. There’s nothing quite like having a bird’s eye view of the glittering waters of the Indian Ocean, as you fly over white sandy Islands. 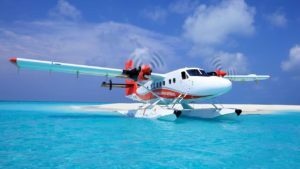 If you do have the option between a seaplane and a speedboat to get to your Maldives resort, then we definitely recommend going for the seaplane. Some of the closest islands will only offer speedboat transfers. Your Maldives Resort staff will be able to offer options for you and book them for you too. It’s worth noting that seaplanes cannot depart after dark, so if your flight is arriving late then you may have to spend the night on the main island. If this is the case then we can recommend Hulhule Island Hotel. The seaplane also come with a luggage restriction which is typically 25 grams. You may be able to purchase more if you have overweight baggage, however, it’s always best to check in advance just in case. The Maldives have two distinct Seasons known as the dry season and the monsoon season, or the high season and the low season. The high season runs between December and March. During this time, expect hotel rates to double too. The resorts will also be busier during these time and rooms often get booked up with plenty of time in advance. During the late season you can expect drizzle but this typically passes pretty quickly, and it’s warm rain too so you can still enjoy a dip in the ocean. 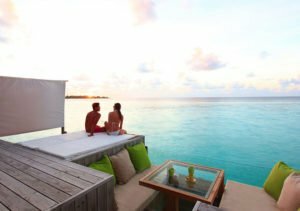 A benefit of visiting in the off-season is that you can score some great deals on Maldives resorts – plus it will be a little quieter during this time too. For a full a full weather low-down, check out this ‘Maldives weather month-by-month‘ article. 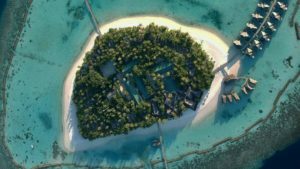 It is worth swotting up on the different accommodation packages available in the Maldives, and then searching for a Maldives resort accordingly. 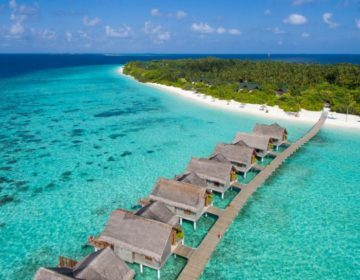 The Maldives actually have one of the highest concentration of all-inclusive hotels in the world, and they can be an excellent choice for holidaymakers. Because of their remote location, it costs a lot to import items (including food), which results in super high prices. An all-inclusive option allows you to enjoy all wonderful world cuisines, alcoholic and soft drinks – and snacks too, without having to worry about a sky-high bill at the end. For many, an all inclusive package is the best way to go on a vacation to the Maldives. If your budget allows, then you may want to go for a room-only option at one of the luxury Maldives resorts that don’t offer all-in. This means that you’ll be able to pick from the variety of restaurants and have access access to premium spirits and champagnes too. 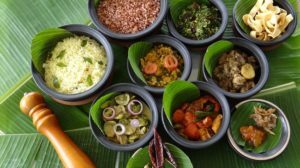 If you’re going for this option, then we definitely recommend heading over to the Maldives Resort website, and checking out and sample menus from the restaurants. This way you will get an idea of not only what they offer but how much they’re going to cost. If you’re looking for a highly rated all-inclusive resort then we can highly recommend the Centara Grand Resort. We are also pretty crazy about Constance Moofushi Resort and Spa. Both offer some of the most generous all-inclusive packages that we’ve seen, including extensive buffet breakfast, delicious lunches and a la carte dinners, and don’t even get us started on the deserts. Click on the links to find out more about their all-inclusive packages and to get the latest deals. When you land in Male International Airport, you may want to switch your clocks to the local time. But it’s good to know that the local Islands also can run on their own island time that is different from the main airport. This island time will depend on where you’re staying and how far away it is from the main island, so double check as soon as you arrive. And last but by no means least is that the Maldives have an incredibly fragile ecosystem. 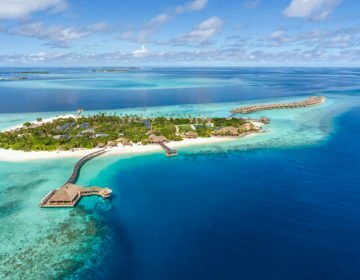 Because of this, many of the big Maldives Resorts have a number of eco-friendly initiatives in place to ensure that they are not causing damage to the environment. This can include things like coral preservation, water conservation, and minimizing the use of plastics. 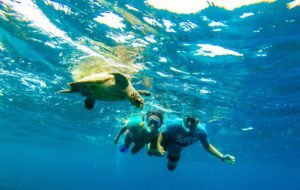 When traveling to the Maldives – as with when traveling to any place – you should try and do your bit in order to keep a low footprint and help maintain the stunning the beauty of the area. One of the things to keep in mind is that it’s actually illegal to take any form of shell, sand or coral back with you. This helps to keep the beaches in the most beautiful and natural state. So even though it can be tempted to take some sand or a shell, please just choose to leave it in its natural home. 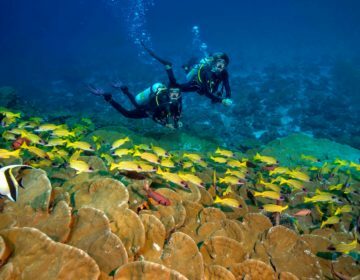 The Maldives are one of the best diving hotspots in the world, and the underwater seascapes are filled with a diverse selection of colorful marine life. If you do plan on going diving or snorkeling, then please do so respect the environment too. When swimming with flippers, it can be all too easy to stand on the coral and damage it. Remember that coral is actually living, and can be home to many sea creatures. So damaging the coral can wreak havoc on the ecosystem that too. Always be aware of why you put your feet and make sure it’s only down on sand and not on coral. So there you have it, nine things you need to know before you jet-off to those soft, sandy beaches (we are very jealous). Take these things into consideration before you leave and you’ll be golden. If you’re thinking of booking a trip to the Maldives, then we have a huge selection of articles which will help you to plan a magical vacation. Click here to take a look at our favorite Maldives resorts, and check out this article on what to pack for your Maldives vacation. Happy Travels!